Quiet yellow-sand beaches and historical sites may lure visitors to Con Dao but it’s the old tropical trees that protect them from the scorching sunshine in the archipelago off the southern province of Ba Ria-Vung Tau. 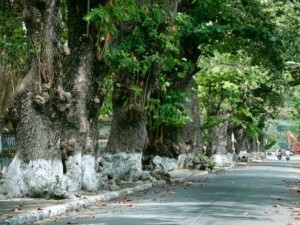 There are a number of cay bang trees which are over 100 years old and hang over Ton Duc Thang and other roads in Con Dao to provide respite from the heat for tourists, who ride past on their motorbikes or stroll around. Strong winds and sunshine may be not be your idea of a nice break but these noticeable characteristics have turned out to contribute to shaping the trees into distinctive bonsais. The trees are spread out over two lanes of the seaside roads and they shield pedestrians taking a leisurely stroll on the pavement between the tree lines and mossy yellow walls of the old prisons, from the sun. From tourists resorts, beyond the lines of tropical trees in the esplanade, you can witness the calm of the sea, with fishing boats bobbing on the water and the distant mountains. At a little coffee shop called Con Son, you can sip a cup of coffee and rest after a long trek at the seaside or in the forests. Breaths of wind blow in from the ocean sending red leaves of the tropical trees down onto your table as drops of coffee are slowly seeping through the filter, and whet traveler’s appetite for more adventure in the quiet town of Con Dao. Inside and outside this small town there are other types of ancient trees including the banyan whose roots cover the ruins of historical sites. Underneath these roots contain untold stories about the bravery of revolutionary fighters who shed blood for the independence of Vietnam.